Reincarnation, literally to be made flesh again, as a doctrine or mystical belief, holds the notion that one’s ‘Spirit’ (‘Soul’ depending on interpretation), ‘Higher or True Self’, ‘Divine Spark’, ‘I’ or ‘Ego’ (not to be confused with the ego as defined by psychology) or critical parts of these returns to the material world after physical death to be reborn in a new body. The natural process is considered integrative of all experiences from each lifetime. A new personality feature, with the associated character, is developed during each life in the physical world, based upon past integrated experience and new acquired experiences. Some reincarnation philosophies express the idea that rebirth is made each time in alternated female and male type of bodies. Also that there is interaction between predeterminism of certain experiences or lessons intended to happen during the physical life, and the free-will action of the individual as they live that life. This doctrine is a central tenet within Hinduism, Sikhism, Jainism, Surat Shabda Yoga, Spiritism, some African religions, as well as various other religions teachings and esoteric philosophies. Most modern Pagans also believe in reincarnation. Reincarnation is traditionally understood to be akin to the Buddhist concept of Rebirth, but in fact the two concepts are very distinct philosophically — Buddhism teaches reincarnation is not of a permanent self or soul but says the opposite view is also an error. Buddhism is not unified as to what that actually means and some might stress the view of no self, while others tend to the teachings of Hinduism stressing the view of everything is ultimately self. An advanced Buddhist and an advanced Hindu would likely perceive the phenomenon of reincarnation identically. Belief in reincarnation is an ancient phenomenon; in various guises humans have believed in a future life since the Ancient Egyptians, perhaps earlier, and ancient graves containing both people and possessions may testify to beliefs that a person would have need for their treasured possessions once again despite physical death. People live on this earth, and then live in some kind of afterlife for the rest of eternity — variously called heaven (paradise) or hell, or the Kingdom of the Dead, or some higher plane, or similar. They do not return to earth as such. People die, but will return to the earth or are revived in some final Judgement, or at some final battle (eg the Norse Ragnarok). They may go to heaven or hell at that time, or live again and repopulate the earth. This is often called an apocalyptic vision of the future. People die, and are returned to this or another existence continually, their form upon return being of a ‘higher’ or ‘lower’ kind depending upon the virtue (moral quality) of their present life. This is often called Transmigration. Tradition commonly holds that certain people (such as the Dalai or Panchen Lamas in Buddhism) can be identified by looking for a child born at the time of their death, and by certain signs and knowledge that such a child has of their predecessor life beyond the norm. In the case of Buddhism there are well defined tests of such a child. In Western culture, regression or near death experience has at times provided what are claimed to be past life memories, some of which can in theory be verified, and some of which might be tested for fraudulent claims. Some aspects of these tend to be quite consistent in some ways (beings of light, messages of love and peace, etc), a factor which to some people lends credence to the idea, and to others supports that «something» is going on but without certainty what that might be. Last, for many people, the evidence is internal and empirical, personal belief or experience. This may not be proof as such, but to them, qualifies as sufficient evidence to believe it. As the introduction suggests, there is an apparent difference between lower-order Buddhism and lower-order Hinduism in as much as the former emphasises that the ego or personal self is empty of content and does not truly exist whereas the latter tends towards the position that the Jiva or personal self while existing, is none-the-less a false self. For Buddhism in part, this is a linguistic artefact in that the remainder (after the personal self is «neutralised, detached from its internalised tendencies , transcended») is said to be nothingness whereas for Hinduism this residual is the â€śhigher-selfâ€ť, the Atman or more properly in English the «True Self». In either case both Buddhism and Hinduism hold this state to be â€śbeyond descriptionâ€ť for the inhabitants of the â€śnormal everydayâ€ť world. To the western mind this last-mentioned world is often termed the â€śreal worldâ€ť whereas to both Buddhism and Hinduism this is the world of â€śSamsaraâ€ť and of â€śname and formâ€ť respectively. The Real is, for Hinduism, the supra-consciousness that perceives the world of name and form to be empty, or at best sees it as a â€śmental constructâ€ť. Shiva is thus termed â€śthe destroyerâ€ť because his is the name attached to the consciousness, in realisation of which, the destruction (dissolution) of the world of name and form, is seen. For Buddhism this same realm is â€śNirvanaâ€ť, the perspective of the Buddha-mind. Through either linguistic construct, the viewpoint must be treated as the same and in both cases; freedom from Samsara is â€śon offerâ€ť. It may be asked how reincarnation fits into this picture. In a word, for Buddhism it doesnâ€™t fit at all, for if there is no personal self there can be no soul but since the Buddha himself referred to his past-lives it must be inferred that these existed only in the world of the mind and that this is furthermore exactly the same state as is perceived by the one experiencing (or immersed in) the cyclic manifestation of Samsara. For Hinduism this state both exists and does not exist so that it may be likened to a dream-state, unreal in every sense. Thus from both perspectives, reincarnation cannot be likened to the re-appearance of the spirit or person within a physical body which inhabits an objective physical world rather, the perception of the world alone exists as a manifestation, around the conscious being, and this is maintained as an act of mind only. To be trapped in Samsara then is to be held by ignorance of the true nature of being, in a self-created world of error. As such, this is really nothing other than a dream. The major point referenced by both Buddhism and Hinduism concerns the necessity of awakening from this repetitive dream-state by obtaining â€ťNirvanaâ€ť for the former and by achieving â€śEnlightenmentâ€ť for the latter. Both are words specifying the exact same state and all lives, past & present, are then to be seen as products of mind only. Many paths are offered toward this state of liberation or â€śheavenâ€ť and most are generally initiated by proposing this life to be â€śrealâ€ť. This of course means that past-lives are also to be seen as real. However, significant progression on any such path soon causes this initial, every-day concept of â€śrealityâ€ť to wither away. As unity with the god-head is approached, the essence of being is recalled with the result that the previously perceived â€śrealityâ€ť vanishes as unity is achieved. Whilst science is perhaps not as scathing of reincarnatory belief as it is of many other metaphysical concepts, and many claims have been documented in a scientific manner, it is important to be aware that formally, mainstream science does not accept yet that reincarnation is a proven phenomenon, or that it happens. Many apparently proven phenomena turn out to be illusional over time, and others, such as the soul, are often deemed by many to simply be unknowable, and hence by definition outside its province. In India this doctrine was thoroughly established from ancient times. While metempsychosis was not established in the older sections of the Vedas, it was explicated first in the Upanishads (c. 1000 BC — AD 4), which are philosophico-mystic texts held to be the essence of the Vedas. The idea that the soul reincarnates is intricately linked to karma, whose first explication was also seen in the Hindu books of the Upanishads. The idea is that individual souls, jiva-atmas pass from one plane of existence and carry with them samskaras (impressions) from former states of being. These karmic agglomerations on the soul are taken to the next life and result in a causally-determined state of being. In some schools of Hinduism liberation from samsara, the cycle of death and rebirth, is considered the ultimate goal of earthly existence. This is known as Moksha, mahasamadhi (or nirvana, also found in Buddhism) in Hinduism. Other Bhakti traditions assert that liberation from samsara is merely the beginning of real spiritual life and beyond nirvana activities still continue, but that they are no longer of a worldly nature. Both sides agree on the pheomenom of reincarnation itself. Buddhism and Vedanta (in particular Advaita Vedanta) further promoted the notion of nirvana following the advent of the great Hindu sage Adi Shankaracharya. The idea that stilling one’s karmas (actions) and becoming at one, harmonious, with all would free one, ultimately, from reincarnation, became a central tenet of Hinduism. It displaced more complex Puranic systems positing the gradual progression of a soul through 8,400,000 (sometimes more) lives until eventual awakening. Instead, it relied more on the idea of self-growth and enlightenment through Yoga. Buddhism differed in that it felt there was no soul to reincarnate and developed an elaborate complex of metaphysical explanations for temporary states of ego to explain rebirth. The Reincarnation of living beings on this earth is explained in Great omnipotent Design- » article. Since according to Buddhism there is no permanent and unchanging soul there is no metempsychosis in the strict sense. However, Buddhism never rejected samsara, the process of rebirth or reincarnation; there is debate, however, over what is transmitted between lives. In spite of the doctrinal beliefs against the idea of a soul, Tibetan Buddhists do believe that a new-born child may be the reincarnation of someone departed. In Tibetan Buddhism the soul of an important lama (like the Dalai Lama) is supposed to pass into an infant born nine months after his decease. The Buddha has this to say on reincarnation.Kutadanta continued:»Thou believest, O Master, that beings are reborn;that they migrate in the evolution of life;and that subject to the law of karma we must reap what we sow.Yet thou teachest the non-existence of the soul!Thy disciples praise utter self-extinctionas the highest bliss of Nirvana.If I am merely a combination of the sankharas,my existence will cease when I die.If I am merely a compound of sensations and ideas and desires,whither can I go at the dissolution of the body?» Said the Blessed One:»O Brahman, thou art religious and earnest.Thou art seriously concerned about thy soul.Yet is thy work in vain because thou art lackingin the one thing that is needful. «There is rebirth of character,but no transmigration of a self.Thy thought-forms reappear,but there is no egoentity transferred.The stanza uttered by a teacheris reborn in the scholar who repeats the word. In Jainism, not only animals and humans but devas (gods) also reincarnate after they die. A Jainist, who accumulates enough good karma, may become a god; but, this is generally seen as undesirable since gods eventually die and one might then come back as a lesser being. Some ancient Greek philosophers believed in reincarnation; see for example Plato’s Phaedo and The Republic. Pythagoras was probably the first Greek philosopher to advance the idea. We do not know exactly how the doctrine of metempsychosis arose in Greece; most scholars do not believe it was borrowed from Egypt or that it somehow was transmitted from ancient Hindu thinkers of India. It is easiest to assume that earlier ideas which had never been extinguished were utilized for religious and philosophic purposes. The Orphic religion, which held it, first appeared in Thrace upon the semi-barbarous north-eastern frontier. Orpheus, its legendary founder, is said to have taught that soul and body are united by a compact unequally binding on either; the soul is divine, immortal and aspires to freedom, while the body holds it in fetters as a prisoner. Death dissolves this compact, but only to re-imprison the liberated soul after a short time: for the wheel of birth revolves inexorably. Thus the soul continues its journey, alternating between a separate unrestrained existence and fresh reincarnation, round the wide circle of necessity, as the companion of many bodies of men and animals.» To these unfortunate prisoners Orpheus proclaims the message of liberation, that they stand in need of the grace of redeeming gods and of Dionysus in particular, and calls them to turn to God by ascetic piety of life and self-purification: the purer their lives the higher will be their next reincarnation, until the soul has completed the spiral ascent of destiny to live for ever as God from whom it comes. Such was the teaching of Orphism which appeared in Greece about the 6th century BC, organized itself into private and public mysteries at Eleusis and elsewhere, and produced a copious literature. The earliest Greek thinker with whom metempsychosis is connected is Pherecydes; but Pythagoras, who is said to have been his pupil, is its first famous philosophic exponent. Pythagoras probably neither invented the doctrine nor imported it from Egypt, but made his reputation by bringing Orphic doctrine from North-Eastern Hellas to Magna Graecia and by instituting societies for its diffusion. The real weight and importance of metempsychosis in Western tradition is due to its adoption by Plato. Had he not embodied it in some of his greatest works it would be merely a matter of curious investigation for the Western anthropologist and student of folk-lore. In the eschatological myth which closes the Republic he tells the story how Er, the son of Armenius, miraculously returned to life on the twelfth day after death and recounted the secrets of the other world. After death, he said, he went with others to the place of Judgment and saw the souls returning from heaven and from purgatory, and proceeded with them to a place where they chose new lives, human and animal. He saw the soul of Orpheus changing into a swan, Thamyras becoming a nightingale, musical birds choosing to be men, the soul of Atalanta choosing the honours of an athlete. Men were seen passing into animals and wild and tame animals changing into each other. After their choice the souls drank of Lethe and then shot away like stars to their birth. There are myths and theories to the same effect in other dialogues, the Phaedrus, Meno, Phaedo, Timaeus and Laws. In Plato’s view the number of souls was fixed; birth therefore is never the creation of a soul, but only a transmigration from one body to another. Plato’s acceptance of the doctrine is characteristic of his sympathy with popular beliefs and desire to incorporate them in a purified form into his system. Aristotle, a far less emotional and sympathetic mind, has a doctrine of immortality totally inconsistent with it. In later Greek literature the doctrine appears from time to time; it is mentioned in a fragment of Menander (the Inspired Woman) and satirized by Lucian (Gallus 18 seq.). In Roman literature it is found as early as Ennius, who in his Calabrian home must have been familiar with the Greek teachings which had descended to his times from the cities of Magna Graecia. In a lost passage of his Annals, a Roman history in verse, Ennius told how he had seen Homer in a dream, who had assured him that the same soul which had animated both the poets had once belonged to a peacock. Persius in one of his satires (vi. 9) laughs at Ennius for this: it is referred to also by Lucretius (i. 124) and by Horace (Epist. II. i. 52). Virgil works the idea into his account of, the Underworld in the sixth book of the Aeneid (vv. 724 sqq.). It persists in antiquity down to the latest classic thinkers, Plotinus and the other Neoplatonists. Classic works of the Kabbalah, Shaar ha Gilgulim («Gate of Reincarnations») of Arizal or Isaac Luria, describes complex laws of reincarnation gilgul and impregnation ibbur of 5 different parts of the soul. It shows many references of reincarnation in the Hebrew Bible (the Tanach). The notion of reincarnation is not openly mentioned in the Hebrew Bible. The classical rabbinic works (midrash, Mishna and Talmud) also are silent on this topic. The concept was elucidated in an influential mystical work called the Bahir (Illumination) (one of the most ancient books of Jewish mysticism) which was composed by the first century mystic Nehunia ben haKana, and gained widespread recognition around 1150. After the publication of the Zohar in the late 13th century, the idea of reincarnation spread to most of the general Jewish community. Martin Buber’s collection of Legend of the Baal-Shem (Die Chassidischen BĂĽcher) includes several of the Baal Shem Tov’s stories that explicitly discuss concrete cases of reincarnating souls. Rabbis who rejected the idea of reincarnation include Saadia Gaon, Hasdai Crescas, Yedayah Bedershi (early 14th century), Joseph Albo, Abraham ibn Daud and Leon de Modena. Saddia, in Emunoth ve-Deoth, concludes Section vi with a refutation of the doctrine of metempsychosis. Crescas writes that if reincarnation was real, people should remember details of their previous lives. Bedershi offers three reasons why the entire concept is dangerous: (a) There is no reason for people to try and do good in this life, if they fear that they will nonetheless be punished for some unknown sin committed in a past life. (b) Some people may assume that they did not sin in their past life, and so can coast on their success; thus there is no need to try hard to live a good life. In Bedershi’s view, the only psychologically tenable worldview for a healthy life is to deal with the here-and-now. (c) The idea presents a conundrum for those who believe that at the end of days, God will resurrect the souls and physical bodies of the dead. If a person has lived multiple lives, which body will God resurrect? Joseph Albo writes that in theory the idea of gilgulim is compatible with Jewish theology. However, Albo argues that there is a purpose for a soul to enter the body, creating a being with free will. However, a return of the soul to another body, again and again, has no point. Leon De Moden thinks that the idea of reincarnation make a mockery of God’s plans for humans; why does God need to send the soul back over and over? If God requires an individual to achieve some perfection or atone for some sin, then God can just extend that person’s life until they have time to do what is necessary. de Modena’s second argument against reincarnation is that the entire concept is absent from the entire Bible and corpus of classical rabbinic literature. «Over time however, the philosophical teaching limiting reincarnation to human bodies emerged as the dominant view. Nonetheless, the idea that one can reborn as an animal was never completely eliminated from Jewish thought, and appears centuries later in the Eastern European folk tradition». While many Jews today do not believe in reincarnation, the belief is common amongst Orthodox Jews, particularly amongst Hasidim; some Hasidic siddurim (prayerbooks) have a prayer asking for forgiveness for one’s sins that one may have committed in this gilgul or a previous one. Many Gnostic groups believed in reincarnation. 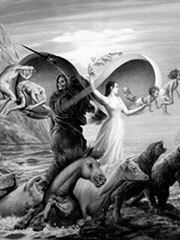 For them, reincarnation was a negative concept: Gnostics believed that the material body was evil, and that they would be better off if they could eventually avoid having their ‘good’ souls reincarnated in ‘evil’ bodies. Note: The text above is not from the original Gospel of the Nazirenes, which now exists only in fragments. Rather, it is the product of «channeling» and of recent origin. Almost all present official Christian denominations reject reincarnation: exceptions include the Liberal Catholic Church and the Rosicrucian Fellowship. There is clear evidence that doctrines of reincarnation circulated in the early Church (before the 6th century A.D.) and were at least tolerated within the Church at that time. Two Church Fathers, Origen and Clement of Alexandria are frequently cited as supporting this. Origen’s writings have only come down to us heavily edited ‘to conform to Church doctrine’, and Origen’s writings were later declared heretical by the Church (though Origen himself was not). However, Gregory of Nyssa cites Origen: By some inclination toward evil, certain souls .. come into bodies, first of men; then through their association with the irrational passions, after the allotted span of human life, they are changed into beasts, from which they sink to the level of plants. From this condition they rise again through the same stages and are restored to their heavenly place. (B.W. Butterworth, On First Principles, Book I, Chapter VIII (New York: Harper & Row, 1966), p. 73). Before the Church expurged what it considered his heretical ideas from editions of his works, other quotes of Origen were also recorded by early Church fathers that make it clear that he did indeed teach reincarnation. For a very balanced presentation of Origen’s relationship to reincarnation, including many more quotes, see . Kurt Eggenstein claims that «Jerome wrote in a letter to Demetrius that among the early Christians, the doctrine of reincarnation had been passed on to the elect, as an occult tradition.» He also quotes Gregory of Nyssa as saying that «It is a necessity of nature that the soul becomes purified in repeated lives.» His cites many more Christian authorities who have supported a belief in reincarnation. In the New Testament, there are several passages that demonstrate that a belief in reincarnation was prevalent amongst those of Jesus’ inner circle. He is asked if he is Elias, for example, in John 1:21; in Matthew 16:13-14 Jesus asks his disciples, â€?Who do men say that I, the Son of Man, am?â€™ And they said, â€?Some say that you are John the Baptist; some, Elias; and others, Jeremias, or one of the other prophets.â€™ Such statements are only comprehensible if Jesus’ disciples believed in reincarnation. Finally, in Matthew 11:13-14, Jesus says: For all the prophets and the law prophesied until John. And if ye will receive it, this is Elias, which was for to come. This can only be understood in the light of the traditional Jewish prophecy that Elijah (Elias) would return one day, bringing on the Messianic age. The Gnostic gospels include clear references to reincarnation, and it is clear that this early Christian (heretical) sect believed in this (see above). There is also scriptural evidence in the official gospels which supports the claim that early Christians believed in reincarnation. Matthew 19:28 states: «Verily I say unto you, that ye which have followed me, in the regeneration (Greek — pale-genesia literally, rebirth) when the Son of Man shall sit in the throne of his glory, ye also shall sit upon twelve thrones, judging the twelve tribes of Israel.» A more well-known passage from John 3:3 reads, «..Except a man be born again (Greek — ano-then), he cannot see the Kingdom of God.» The quote from John is sometimes translated as «born from above», and is the inspiration for the modern evangelical movement. Both passages taken together unambiguously support the notion that reincarnation had a place in early Christianity. A number of Evangelical and (in the USA) Fundamentalist Christian groups denounce any belief in reincarnation as heretical, and explain any phenomena suggestive of it as deceptions of the devil. Rudolf Steiner, Christianity and Mystical Fact. when you were dead and God gave you life? In his Masnavi, Rumi speaks about the seventy-two forms I have worn. Modern Sufis who embrace the idea of reincarnation include Bawa Muhaiyadeen (see his To Die Before Death: The Sufi Way of Life) and Hazrat Inayat Khan (see The Sufi Message, vol. V, part 3). Reincarnation is an intrinsic part of many Native American and Inuit traditions. Regardless of the actual religious beliefs and practices of today’s Native Americans, with varying religious beliefs, the idea has survived for centuries. In the now heavily Christian Polar North (now mainly parts of Greenland and Nunavut), the concept of reincarnation is enshrined in the Inuit language. The survival of the concept of reincarnation applies across the Nations in varying degrees of integrity. The Nations are, of course, now sandwiched between Eastern and Western traditions. Reincarnation also appears in Norse mythology, in the Poetic Edda. The editor of the Poetic Edda informs the reader that Helgi HjĂ¶rvarĂ°sson and his mistress, the valkyrie SvĂˇva, whose love story is told in the HelgakviĂ°a HjĂ¶rvarĂ°ssonar, were reborn as Helgi Hundingsbane and the valkyrie SigrĂşn. Helgi and SigrĂşn’s love story is the matter of a part of the VĂ¶lsunga saga and the lays HelgakviĂ°a Hundingsbana I and II. They were reborn a second time as Helgi Haddingjaskati and the valkyrie KĂˇra, but unfortunately their story, KĂˇruljĂłĂ°, only survives in a probably modified form in the HrĂłmundar saga Gripssonar. In the Renaissance we find the doctrine in Giordano Bruno, and in the 17th century in the theosophist van Helmont. During the classical period of German literature metempsychosis attracted much attention: Goethe played with the idea, and it was taken up more seriously by Lessing, who borrowed it from Charles Bonnet, and by Herder. It has been mentioned with respect by Hume and by Schopenhauer. Reincarnation is the core of the doctrine of Spiritism, a tolerant new religious movement started in France in 1857. According to Spiritists the souls will reincarnate to perfect themselves toward communion with God. Reincarnation plays an important role in the ideas of Anthroposophy, a spiritual movement founded by Rudolf Steiner. Steiner described the human soul gaining new experiences in every epoch and in a variety of races or nations. The unique personality and abilities, but also weaknesses, that every human being is born with are not simply a reflection of the genetic heritage — though Steiner described the incarnating soul as searching for and even preparing a familial lineage supportive of its future life; a person’s character is also determined by his or her past lives. Anthroposophy describes the present as being formed by a tension between the past and the future. Both influence our present destiny; there are events that occur due to our past, but there are also events that occur to prepare us rightly for the future. Between these two, there is space for human free will; we create our destiny, not only live it out, just as we build a house in which we then choose to live. Books by Steiner and others on the subject include Reincarnation and Karma, Reincarnation and Immortality, A Western Approach to Reincarnation and Karma, and The Principle of Spiritual Economy in Connection With Questions of Reincarnation. Aside from these more general discussions, six volumes of Steiner’s published lectures are devoted to investigating the karmic relationships of many historical individuals, from Karl Marx to Julian the Apostate. Modern theosophy, which draws its inspiration from India, has taken metempsychosis (or rather reincarnation) as a cardinal tenet; it is, says a recent theosophical writer, «the master-key to modern problems,» and among them to the problem of heredity. The idea of reincarnation is also part of the New Age culture. Today, among newer movements, belief in reincarnation is widespread in New Age and Neopagan circles. It is an important tenet of Theosophy, and central to Spiritism, founded by Allan Kardec. Toward the Light is an example of a contemporary work originating in the western world, which very detailed accounts for reincarnation. Scientology is another new religion that accepts past lives and holds that all beings are truly immortal, although in a variety of levels of awareness. In Scientology, a person’s own actions are their own responsibility. In this context, responsibility or a lack of responsibility can act to create something that is similar to karma in other belief systems. Scientology does not focus on the doctrine of karma as commonly believed (i.e. a mechanism of divine justice). The term karma is not generally used. Much of the controversy involving Scientology arises from the logical extension of the concept of past lives to what is effectively eternity. In this context, past lives not only take place prior to Earth, but also in non-Earth civilizations, and even in universes prior to this one, where conditions and rules of existence can be different. One could even have past lives in civilizations where advanced technology was common and/or routine. Thus a person who once lived in a world destroyed by nuclear war could become upset living in a world where nuclear power has been re-discovered. Such events can also act as a template for future actions and reactions on a knowing and as well as an unknowing basis. Persons and cultures can act out unknowingly, as if in a script, the circumstances that led to unfortunate events in the past. Scientology does not look to Theosophical writings for explanations on the system of past lives, or for a cosmology. Scientology does not assume that beings in the between life area necessarily have the best interests of the individual at heart (it varies), and that the path to increased awareness is not a guaranteed thing. Scientology also holds that people are composite beings, and that the physical body can have a sense of awareness of its own, separate from the mind and the spirit, which memories from its own genetic line can be recalled by an individual, although this is not usually done. In Scientology the term that roughly corresponds to the concepts for spirit or soul is thetan. Scientology does not consider the lack of awareness of past lives to be a good thing. It attributes the general amnesia of past lives to a variety of causes, including, but not limited to, pain, unconsciousness, lack of personal responsibility, and even the decision to forget what had just transpired. Persons can unknowingly assume the personality characteristics of another person. Carried to an extreme, this results in people identifying themselves with famous and/or powerful individuals, even when the circumstances were different. Scientology Counseling addresses this problem as part of a larger body of procedures. In Scientology counselling, knowledge of previous incarnations is not pursued for its own sake. Rather, awareness and knowledge of previous incarnations might occur while resolving a specific matter, such as an injury, etc. arising during counselling. Importance is placed upon resolving these issues, not when or where the past life took place. However, those particular details will become part of one’s understanding as awareness improves in addressing these issues. American mystic Edgar Cayce taught reality of reincarnation and karma, but as instruments of a loving God rather than blind natural laws. Its purpose is to teach us certain spiritual lessons. Animals have undifferentiated, «group» souls rather than individuality and consciousness. Once the soul evolves through a succession of animal incarnations and achieves human status, it is not then reborn in animal form. Cayce’s view arguably incorporates Theosophical teachings on spiritual evolution. In the Seth series of books Jane Roberts talks about reincarnation and life after death. Seth believed that time and space are basically illusions. Consistent with this view, Seth argues that only parts of each person incarnate (appear in physical reality). This last argument is part of Seth’s view that man is a multi-dimensional entity simultaneously alive in many contexts. There are many people nowadays who allegedly «remember» their past lives and use that knowledge to help them with their current lives; this kind of occurrence is fairly central to the New Age faith. Some of the people who remember claim simply to remember without any effort on their part. They simply «see» previous times and see themselves interacting with others. In recalling past lives, there are a number of variations that need to be examined, which are important to its adherants. Theosophical texts maintain that people are constantly evolving, gradually becoming one of the Ascended Masters. In this system, one may be incarnated anyplace in the chain of life, and this is often in connection with life lessons that need to be learned. One often meets with ones spirit guides, one of the Ascended masters, etc. in order to plan the major events for the next life. The element of karma in reincarnation is often seen as a system of devine justice. See also Elizabeth Clare Prophet for a modern exponent of Theosophy. In many common new age beliefs, past life recalls involving lifetimes within the historical record (real or supposed, including legendary places such as Atlantis) are commonly accepted. It is sometimes beliefed that prior to that there was a succession of lifetimes in other lifeforms where one was working to become Human. This seems to borrow ideas from the Darwinian theory of evolution. Lifetimes outside the context of earth are rarely acknowledged. Often, the doctrine of karma as commonly believed is seen to be a mechanism of divine justice, imposed or enforced by rules of the universe. One variation is what one does, comes back to you multiplied three fold. In Tibetan Buddhism one finds the concept of the Six Worlds, where dependant on the quality of one merit or karma, one is re-incarnated as a citizen of one of the six Worlds, these being the world of Gods, World of DemiGods, World of Men, World of Animals, world of Demons, and the world of Hell. The advantadge of the Human realm is that this is the only place where it is possible to achieve enlightenment, and so pass beyond the cycle of suffering. Incarnations in other realms and worlds are acknowledged, but usually this is considered so long ago that it is not very relevant. Theosophical and other related beliefs systems explain the common inability to not remember past lives as a part of the devine plan, and that this is a good thing for a variety of reasons. Souls often appear before a group of beings who sit in judgement, to one degree or another, and who decide where the soul is going to go in their future incarnation. This group of beings is always presumed to be members of the Ascended Masters. Some more recent groups have taken a more sceptical view of this. An interesting variation can be seen in the work of Author Peter Novak, who proposes that reincarnation is part of a larger scheme, where soul and spirit are two different entities, united as one during one’s lifetime, and which separate at death, in a process he calls consciousness division or Division Theory. The division of consciousness is not considered to be a good thing. One other variation, borrowing from the ancient Egyptian, can be seen in the essay The Western Lands by William S. Burroughs, where the doctrine of seven souls is discussed. In this context, the idea is propounded that souls can die a permanent death under unusual circumstances, such as in a nuclear explosion. The most detailed collections of personal reports in favor of reincarnation have been published by Dr. Ian Stevenson in works such as Reincarnation and Biology: A Contribution to the Etiology of Birthmarks and Birth Defects, which documents thousands of detailed cases where claims of injuries received in past lives sometimes correlate with typtical physical birthmarks or birth defects. Perhaps the most significant anecdotal evidence in this regard is the phenomenon of young children spontaneously sharing what appear to be memories of past lives, a phenomenon which has been reported even in cultures that do not hold to a belief in reincarnation. Upon investigating these claims, Stevenson and others have identified individuals who had died a few years before the child was born who seem to meet the descriptions the children provided. In the most compelling cases, autopsy photographs reveal that the deceased individuals have fatal injuries that correspond to the unusual marks or birth defects of the child; for example, marks on the chest and back of a child line up precisely with the bullet entry and exit wounds on the body of an individual who has been shot. However, Stevenson cautions that such evidence is suggestive of reincarnation, but that more research must be conducted. One hypothesis that comes from the channeller Diandra is past life injuries are stored in the cellular memory of a person’s body that can show as birth marks. These cellular memories can also be triggered this lifetime at the same age it occurred in a past lifetime. Diandra cites one example where she was doing a channelled personal session for a doctor that did not believe in channelling or past lives but came to the personal session because his wife wanted him to. The doctor started crying when Diandra moved into a past life where he died of a heart attack at age forty. The doctor revealed he was a heart doctor who had a heart attack at forty this lifetime. Diandra goes on to say that past life cellular memory can be healed and does not have to be repeated. In another personal channelled session Diandra moved into a past lifetime of a woman that was in the 1930’s dust bowl. The woman stopped Diandra and told her she has a fetish of coming home from work everyday and dusting. Objections to metempsychosis include: that personal identity depends on memory, and we do not remember our previous incarnations. An answer given by Hindu philosophers (like Swami Vivekananda) is that though we do not remember our infanthood, we cannot deny its reality. Another common answer is that this perforce requires the limiting of memory to the known life, thus creating a circular argument; the past life cannot be real because they are not remembered, because whatever it is that is claimed to be a memory does not meet the definition of memory as belonging to this life only, and therefore cannot be considered a memory. Another philosophical answer is that the soul, or whatever it is that lives these hypothetical multiple lives, is influenced throughout all its qualities by the qualities of the body, and as bodies vary, whatever travels between them would not be the same consciousness. If the soul of a dog were to pass into a man’s body, the argument goes, it would have to be so changed as to be no longer the same soul; and so, in a less degree, of change from one human’s body to another. RenĂ© GuĂ©non and others maintain that Reincarnation is both a recent concept (created in the 1800 by Spiritists and Theosophists) and distinct from both metempsychosis (which he describes as an influence from psychic residue that does not involve any true soul or personal essence) and transmigration (which for him, while often mistaken with reincarnation, actually describes the change of a once-corporeal being into some other non-corporeal state). That viewpoint is detailed in his 1923 book «The Spiritist Fallacy». Some scientists and skeptics, such as Paul Edwards, have analyzed many of these anecdotal accounts. In every case they found that further research into the individuals involved provides sufficient background to weaken the conclusion that these cases are credible examples of reincarnation. Others, such as philosopher Robert Almeder, having analyzed the criticisms of Edwards and others, say that the gist of these arguments can be summarized as «we all know it can’t possibly be real, so therefore it isn’t real», a well known logical fallacy traditionally called an Argument from Lack of Imagination. Critics who claim that reincarnation is impossible often espouse the alternate theory that a large number of mental phenomena such as memory and ability are already accounted for by physiological processes; and may point to moral and practical inconsistencies in the various theories of reincarnation. To the materialistic mind, Occam’s Razor would then seem to dictate that the critical view is to be preferred, as it demands no extraordinary new evidence beyond what is already known to science. A more skeptical view is that without conclusive evidence showing that reincarnation exists (regardless of the current state of science), the theory of reincarnation cannot be considered to be a valid theory worthy of formal scientific recognition and acceptance. Some skeptics explain the abundance of claims of evidence for reincarnation to originate from selective thinking and the psychological phenomena of false memories that often result from one’s own belief system and basic fears, and thus cannot be accounted as empirical evidence. Another argument often made is that claims of reincarnation by casual adherents are usually of having been some famous historical figure instead of being another animal or an insignificant person. This argument, however, is seldom substantiated with a quantitative count of famous and non-famous reincarnation claims, and many accounts are of peasant or other little known people. Because of such skepticism, many people who feel they may have lived a past life tend to be quite circumspect which whom they discuss this. An example of the frustration that can be experienced can be found in the exercise of trying to prove that one had once lived in a city in another part of the country. A skeptical view can explain cynically away all such memories, etc. as based on fraud, research, memories from movies and theater productions, and other alternate explanations; in fact anything explanation, other than admitting that someonen ow living in City Two had once lived in City One, regardless of the actual truth of the matter. A belief in reincarnation does not discount the existence of heaven, hell, or a final judgment. There are a number of small children who have reported having memories of past lives prior to their present life, and some also report being able to recall a time between lives (see books by Dr. Ian Stevenson, Carol Bowman, Dr. Jim B. Tucker, and Elisabeth Hallett). In some cases these children have also reported being in a place like heaven between lives, and sometimes that they were given some degree of choice as to whether and when to be reborn, and even in selecting their future parents. Some of these children claim that being reborn is not necessarily a punishment for past bad «karma«, but rather an opportunity for a soul to grow spiritually. Additional lifetimes could give individual souls a greater opportunity to accomplish more for God, if that is a person’s goal, and to develop better character traits. Eastern views of reincarnation vary and several parallels with this idea are to be found in certain branches of Hinduism and Buddhism. A more dramatic idea is espoused in at least one account, of a woman who was raped at age 37, and was treated amongst other ways, with regression therapy. It seems she was attempted to be regressed prior to her birth, and reported that she had decided that a traumatic incident would be needed at around that time, to change her life from its previous path. If such accounts were true, they would have profound implications for human life. Does Mind Survive Physical Death? ITC Voices: Contact with Another Reality? Who’s Afraid of Life After Death? Why NDE Evidence is Ignored . Acharya, Pt. Shriram Sharma (1999).